The punchline, of course, is that the two studies come from the same data. Judea Pearl mentions it as a throwaway comment in a general talk “The Art and Science of Cause and Effect,” which I read in his great work Causality. In particular, the paper referenced was Goldberger’s 1984 paper Reverse Regression and Salary Discrimination, with actual data demonstrating the effect (though with a different color palette). I find it surprising that Pearl would dedicate an entire chapter in Causality to Simpson’s Paradox but only one comment in the talk to this effect. While it is somewhat similar to Simpson’s Paradox (which I may talk about some other time), they are decidedly different in origin and I find this phenomenon much more relevant, prominent, and chilling. Let me explain. I’ve heard this comment several times already. 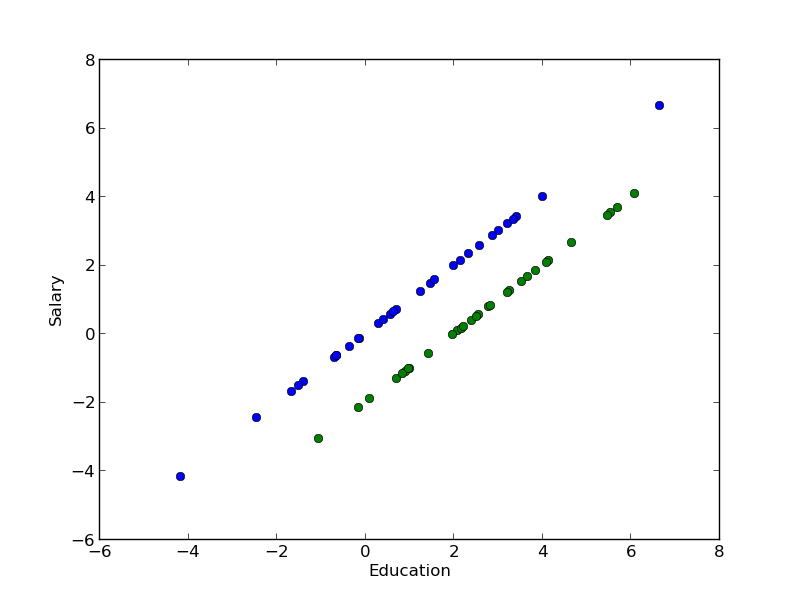 The argument goes something like this: unless the data is really pathological, we can assume the data is something like a curve for each blue and green on the education vs. salary plot. Let’s say that education is the x-axis and salary the y-axis. The first report shows that in general we need to have the blue curve above the green curve at all vertical slices of the graph. But this means the blue curve must be left of the green curve at all horizontal slices of the graph, which contradicts the second report. for whatever reason, have the blue men be more educated than the green men and thus get more salary (this could be, of course, due to prior discrimination in the history of the world, socioeconomic circumstances, etc. But the point is we don’t have that kind of information in our data. That’s why I stressed that the employers were just and not the world). important: add some noise. So we don’t have well-defined lines, but some variation in ability and occasional misplacement of salary to ability. And now you see it — on vertical slices, blue tend to be higher; on horizontal slices, blue tends to be on the right, something that we thought was very counter-intuitive due to the “lines” model. As Boris Alexeev pointed out to me, the noise is actually doing all of the work in this model! The watchful reader will notice that this model makes very few assumptions and is very natural, and surely he/she can make some ideas of real-world data that follows this pattern. This is one main difference between the reverse regression effect and Simpson’s Paradox — by some fairly natural definition of “random,” a random set of data will get into the Simpson’s Paradox situation about 1/60 of the time (see Pearl). The RRE does not depend on such coincidences. So what is really going on? Some people get very impatient at this point: “is there discrimination or is there not?” Well, whether you believe my simple generative model or not, what is objectively going on is just that the data is telling a very simple story, which is that A) blue men are more educated and B) more educated people get paid more. Sadly, by trying to torture the data to make it talk, we are overstepping our bounds on what we can extract from the data. What the two activists are doing is trying to pull some complicated mechanism, like discrimination, out in a contorted way from very simple data. discrimination-2: we don’t see it, but we don’t see evidence against either. We don’t have the right kind of data to find discrimination-2. Yes, reductionism makes it more complicated. But it is necessary if we need to make precise judgments. Why did I mention the Dark Arts? Can this information be maliciously used? Hell yes. I’ve literally just given you a recipe to finagle the politically charged idea of discrimination, GOING BOTH WAYS, from a single set of data. So if you feel like it, you can take basically any reasonable population story and create a perfectly-reasonable-sounding discrimination case against either side! I can even go a step further and see a use case when someone can point to this very effect to claim that no discrimination has taken place in a world where it really did (for example, maybe discrimination has actually caused the blue-green difference in education in the first place)! It is very important to stress that the RRE does not show that discrimination does not exist, rather that similar data like this example alone does not show discrimination. If this commonplace but nuanced situation is not Dark Arts (the knowledge of which is prerequisite to defend against it) of mathematics, I don’t know what is. The only thing I can do is to use this knowledge responsibly; I hope it has similarly helped you. Thanks to Boris Alexeev for first pointing me towards this effect and Pearl’s work on Causality. It was one of the best time investments I’ve ever made for mathematics. Thought-provoking. It might be informative to dig up cases where public thought-leaders are doing such dark arts. Also, RRE might also be pronounced “multicollinearity”, a situation in regression where two predictors are correlated (in your noisy example, it seems like color is “correlated” with education). @Long: yes, digging up such cases would be good. A lot of times they aren’t even trying to be dark, of course, but the effects may be bad. As for multicollinearity, I agree it is the situation here. I emphasize the E in RRE because the RRE is the actual act of interpretation (reversing the regression to get opposite-sounding effects) by the data scientist than the situation. So I would word it something like “be careful of the reverse regression effect which happens when you have multicollinearity”. Interesting… though I think there is an important point to make. It is not that there isn’t discrimination against blues or greens. There is in fact discrimination against both. Simply, the discrimination takes place with regard to two different criteria, education and salary. Boris is correct in pointing out that the phenomenon wouldn’t exist with no scattering, otherwise all the data would lie on x=y. But what can we conclude from the scattering? That, given an “outlier” amongst the blue population, say a member less educated, an employer is likelier to assign such an outlier a higher salary. And similarly, an “outlier” amongst the green population, say a member more educated, is paid less. What might we conclude from this empirical fact about the outliers? A simple explanation would be that employer believes in “regression toward the mean.” In particular, given the fact that a less educated member of the blue population is an “outlier,” the employer still expects better performance because of his or her race (hence the higher pay). That is to say, the race (more than the level of education) indicates the level of performance. That sounds like discrimination to me. What unifies the two types of discrimination which you describe, that seemingly pull in opposite directions, is that employers STEREOTYPE. Whether such stereotyping is statistically justified in terms of work performance is irrelevant to my point. One might note that I have assumed a certain causal relationship between education and salary–that the latter is, or should be, a function of the former. But I think that is a reasonable assumption. 2) Future mental experiment: I can think of plenty of job situations where race is much more relevant to the job performance than education level; I wonder what “Discrimination” should be then? If you were to trim the outliers so that they conform closer to the pay = edu relation, the effect would be reduced. What the noise does, especially if it’s as strong as the signal–in this case even expanding in an almost perpendicular direction, is to allow comparisons between outliers that are ‘opposite’ (low-pay hi-edu green versus hi-pay low-ed blue, and hi-pay low-ed green versus lo-pay hi-ed blue). It means that within each group, salary and education are not correlated; whether that’s prejudice or not depends on your ideal. Between groups, however, salary and education becomes more of a factor. It doesn’t seem to be a case of ‘regression’ (Is that technically an actual regression?) toward the mean since the centers of the two clusters still lie on the same line. And if you were to prejudice against both equally, then by definition you are not favoring one over the other; then there is no bias between the two. Also known as the Base Rate Fallacy, in epidemiology where the death-rates concentrate the mind a bit. Here this tells you that the market is discounting formal education against the larger Green talent-pool, but then selects harder for promotions. So you see the long and short strategies on education, and that contrast won’t go away. 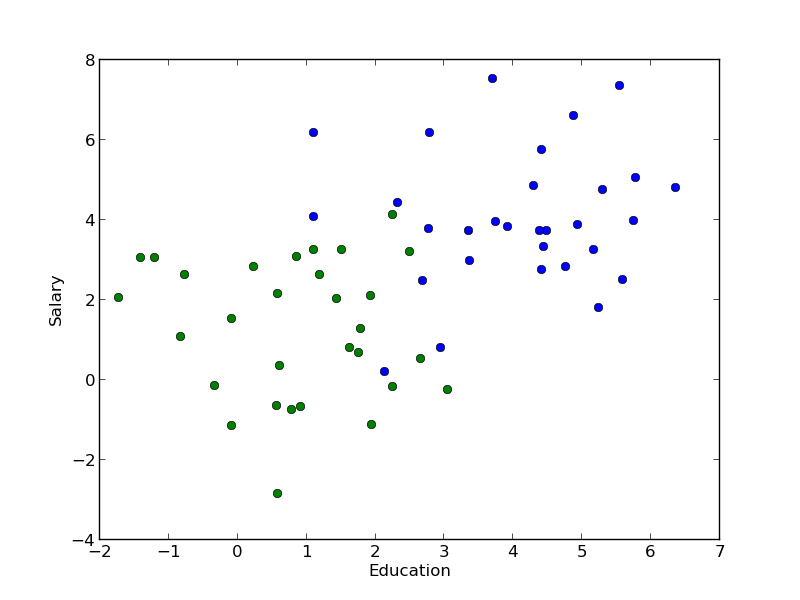 Eyeballing your data, it seems that within colour, education and salary are uncorrelated. So one would model this as “colour identity predicts both education and salary, education and salary have no independent (of colour) effect on each other”. The interesting thing about the effect you describe is that it is very robust: even in the opposite regime, where education predicts salary independent of colour and the between-colour salary differences are entirely mediated by education, you would still observe the regression. I’m not convinced there is a problem over and above the linguistic reality that anything can be presented positively or negatively. After all, while it is plausible that the relation ‘at every salary level green men are less educated than blue men’ can be presented to push a specious meaning with a small or large degree of success, the actual meaning is that it is still the blues and not the greens facing shopfloor discrimination. This is because whereas greens only need to get a baccalaureate, say, in order to breakthrough to a certain level, blues need an undergraduate degree just to stay even. That’s wholly consistent with the verticle. My humble apologies if I missed the point. I’m definitely trying to bat above my paygrade today. I don’t see any “batting above paygrade” done. No worries. =) I *do* think the main point is that anything can be presented positively or negatively. The article is meant for the reader to recognize such things in “real life,” when the same set of statistics can be used to make two sides of a point. I think in our age where things dealing with statistics are heralded as “truth,” it is important to be careful.